The production and converting processes of solid board are not widely known as our products have key benefits required by specific market areas. more information about our company and products on request. The basis of solid fibreboard is waste paper. This is graded and the correct mix is pulped into a stock which is around 95% water and 5% fibre. This is cleaned and screened before its is transferred onto the board machine. Our board is made up of 10 plies and the board machine is known as a multi vat machine. After the grey waste paper middles have been formed, we can then laminate various paper liners onto the board depending on our customers order specifications. This can be anything from plain brown or white Kraft paper to PE lined papers or coated woodfree liners. Once the board had been laminated it is guillotined to the correct size, palletised and ready to be sent into the converting area or directly to our customer if they have ordered sheet board. The first part of our converting process is printing. We can offer both flexo and offset printing depending on the complexity of the artwork. The next part of the process is die cutting to the dimensions and structural design of your required pack. Finally the boxes are glued on a multi point gluing machine. The die cut blanks are loaded onto the gluing machine by a robotic arm. 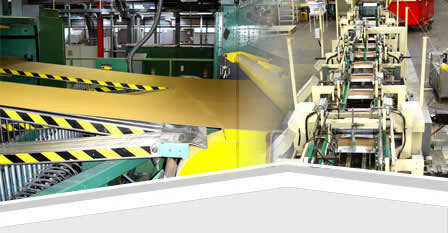 The gluing machines are fitted with cameras that monitor the application of adhesive onto the gluing flaps. If the glue applicators fail then the machine will stop and any boxes made at that time will be quarantined. After gluing the boxes are strapped in bundles and palletised again by robotic arm. The orders are now sent to our warehouse ready for despatch.